The Personalized Learning Summit Starts Tomorrow! We are incredibly excited for the 4th annual Personalized Learning Summit kicking off tomorrow in San Francisco. Hundreds of school and district administrators and educators are gathering for three days full of learning and inspiration from George Couros, Sarah Jones, and each other. You can follow along with the PL Summit on Twitter, or sign up to get news about the Personalized Learning Summit 2019. We are excited to announce the launch of a new podcast series, Elements of Change: Stories from education leaders for education leaders about making transformational change in schools and districts. In our inaugural episode, we sit down with our own Anthony Kim, founder and CEO of Education Elements, to discuss his new book with co-author Alexis Gonzalez-Black: The New School Rules: 6 Vital Practices for Vital and Responsive Schools. The truth is we are fortunate to work with thousands of leaders in hundreds of districts who are implementing innovative solutions to age-old education challenges. There is a ton of power in our Education Elements community, and we wanted a way to broadly share insights and learnings. Check out Episode 1: The Better Teams Element, and subscribe to the podcast on the service of your choice to get new episodes as soon as they're released! Loudoun’s Wave Three Rollout - High School! Loudoun County Public Schools and Education Elements have worked together over the past two years to transform the educational experience for students across the district. This work began with elementary schools and middle schools. The most recent wave of 15 PL schools in Loudoun includes a mix of elementary, middle and high schools. In anticipation of this secondary focus, Loudoun’s district team worked hard to better connect the unique needs of their high schools with the opportunities presented by personalized learning. In February, the district leaders met to begin discussing strategies and structures to support PL implementation in high school. This discussion led to important shifts in the Foundations Workshop our team ran earlier this month. 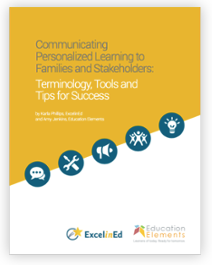 The importance of personalized learning was reframed to better reflect the context of high school and priorities of its students and families. Instead of simulating a station rotation, participants in the Foundations Workshop designed an individualized playlist to build their knowledge of PL. 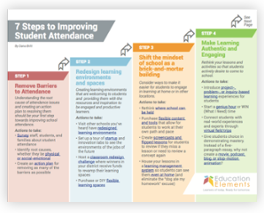 Education Elements is working alongside the district team including content supervisors, instructional facilitators, directors, specialists and coordinators to tailor our support and design an approach that meets the varying needs of elementary, middle and high. The teams at Loudoun and Education Elements are continuing to reflect on the previous structures and support mechanisms schools have used to adopt PL. The upcoming Design Workshop in June will be a new iteration, meant to address the unique needs and strengths that high schools bring to the table. This is the first time Loudoun has rolled out personalized learning to their high schools, and these first four schools will serve as models for the twelve high schools to come.